Wow, I have totally been missing from blogland lately and took an unintentional hiatus from all of this updating yall on stuff. So now Im back- sort of. This is my last week at my internship with 2nd grade and it's also spring break at the preschool (I seriously had no idea that was a thing) which means that I will have much more time to study for finals without extra shifts for work and such. Which also means that I can finally write again, to an extent, at least before we leave and drive up the coast for Easter! We are wanting to find a small, local methodist church (something that reminds us of home, I guess) somewhere up in Monterey or Salinas to have Easter Sunday service with, 'cause there just aren't any of those around here. Not to mention the 3 day weekend for the celebration of our Savior's resurrection gives a great opportunity to see his creation! And we both just really want to see that part of this fabulous state. 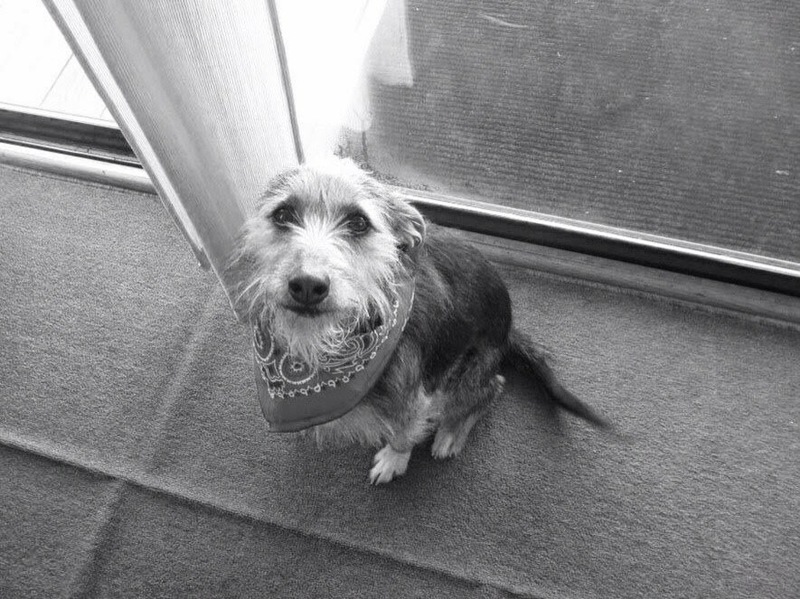 Scruffy loves road trips and will be ecstatic!! We are also going to go whale-watching perhaps, grab some fantastic local seafood (because it is Monterey) and see John Steinbeck's boyhood stomping grounds WHICH I AM SO EXCITED ABOUT! Seriously, as soon as I heard that we were moving to California I started planning a trip up to the Salinas Valley to go to the John Steinbeck Museum and all of that because his writing and stories are my absolute favorite - Oh, East of Eden trumps them all, on my list. We have all of his books and both are cycling through them and love it oh so much. So there's that, which we are both excited about and I'm very happy that is something that Marshall and I share: A love for Steinbeck. Fun right?!! Only the best thing ever! So back to the point - recently, as in a week and a half ago (late, I know) we had another San Diego milso blogger meet-up! (Yes, it was the day after the gender reveal was from my other post) It was a small group this time because it was a little bit short notice. 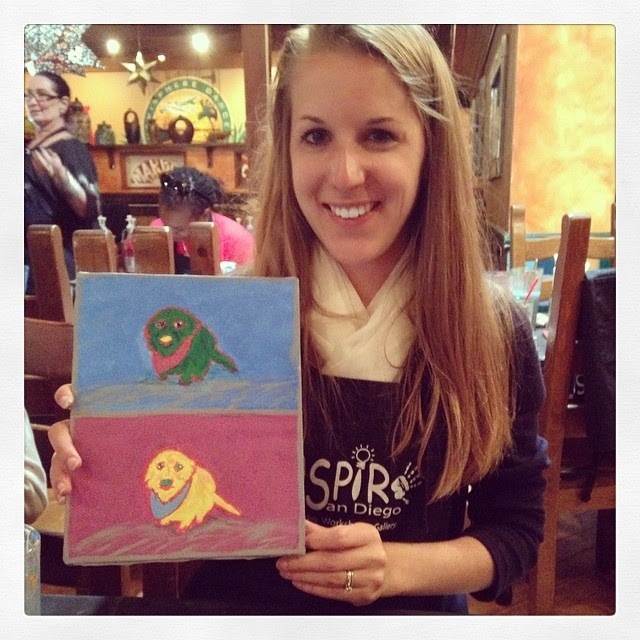 We met in Old Town at a local Mexican restauraunt for some tortilla soup and painting of our pretty little pets. I seriously had three bowls of tortilla soup and a couple glasses of Sprite but that's totally ok by me. It's really a good combination, yall. SO. Then came the painting. We used this fun tracing paper which I absolutely have to find somewhere because I love painting and want to paint the same thing with Trouble, our kitty, now! Oh, so excited to soon have time for crafts again!! We took the canvas, put the tracing paper on top in one section, then tried to sort of center the picture that we printed out on top of that, tape it all together, and get to tracing our sweet pets. If you follow. It was so easy once I knew how to do it, and who doesn't love tracing?! Perfect for if you don't consider yourself artsy or artistic at all - anyone can do it! Then after it was traced, we painted. We chose dominant colors for the pictures then accent colors. We traded colors off to make it look like pop art, like something Andy Warhol would have painted in his time (Campbells soup, anyone?) so, for instance: I chose colors for the fur. One Scruffy looks like spinach and the other looks like the walls in my office (we love yellow so very much). Then I chose background colors, and alternated them between her bandana in either picture. Then her nose was the color of the opposite dog's fur. And so on, and so forth. If that makes any sense at all. And both Scruffy puppies were outlined in a hot pink, and fur was painted on by the awesome art teacher we had who is fantastic at making fur actually look like fur instead of a big blob of color. It was fabulous! 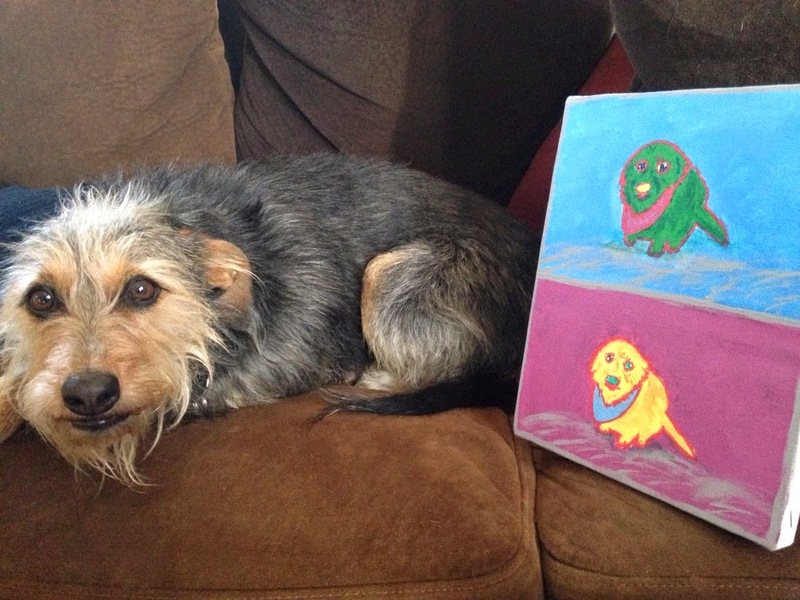 So here is our sweet Scruffy Spice as a painting! She is SO PRECIOUS! We love her to pieces. 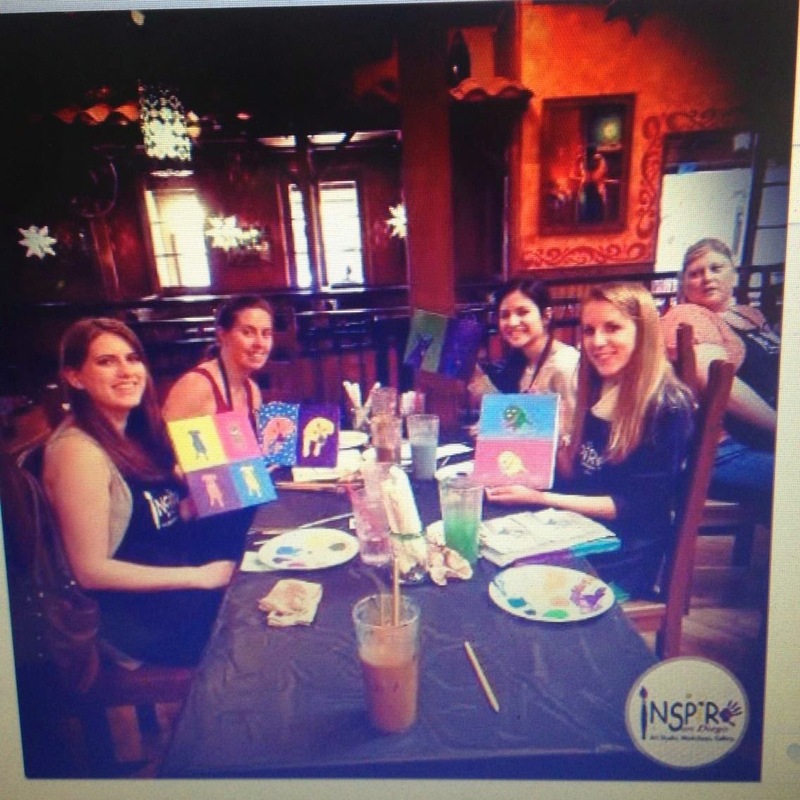 And here is everyone in our little group that day holding up their paintings! It was a small group, only 4 out of nearly 19 now, because it was such short notice and did cost more than just lunch or dinner out would (since we painted too). But it wasn't that much in the grand scheme of things and is easy to replicate for a fraction of the cost so that's fantastic. This picture was taken from the website of the studio who came out to the restaurant, if that makes any sense. The best picture I found of all of us! Such a fun group - next week we are going to brunch and I can't wait!! And finally, here is an absolutely adorable and precious and fantastic picture of our sweet Scruffy Spice girl sitting next to her fabulous portrait! I told you she looks like spinach in the top one. She was so controlled and sweetly sat there, very still (which is kind of unheard of for her) so that I could snap a picture. She sniffed it and even tried to lick the canvas, so I think she likes herself as a painting! It is up on the wall now, hanging in the living room. Our walls are covered with my artwork, crafts and stuff, so that's fun. But seriously, isn't she the cutest thing ever?!! Next up for our little (big) blogger group: brunch in Del Mar next week! SO EXCITED! There have been so many ladies added to the group lately that I haven't had the chance to meet yet, because many recently found out about it or just moved to the area. So this will be absolutely fantastic!!! (There are also 2 other Aggies in our group - Whoop!) You can see how much I love going to the things we have planned each month, finding this group has been one of the best things that's happened for me since we moved out here. I'm glad to have stumbled upon whoever's blog I actually stumbled upon first to see what we can actually do here in San Diego together (I seriously don't remember how exactly I found it), and then it all just happened and ladies keep getting added to the group which is absolutely fantastic. I know that was a run-on sentence but that's totally ok by me for now. Anyway. Now I need to do some studying for the rest of the night and start getting ahead on my final weeks of school. I am definitely going to finish everything and turn it in at least a week early, so that basically means I have 3 weeks left. Oh and await the stud's return. Better get started! Great job Katherine. I wish I could have attended but the fam needed me near! This was so much fun! Can't wait to see everyone for lunch in a few weeks! Wish I could have gone and met you, hopefully I can make the next one. Your picture turned out adorable!